If you like cookies and Frozen then you should check out this Olaf Cookie Jar. The cookie jar looks like a real snowman and that snowman looks like the friendly Olaf from the Frozen movie. The Olaf cookie jar is ceramic and has a silicon seal so that the cookies you store inside it will stay fresh and ready to eat. The Frozen cookie jar is 13 inches tall and will look great in your home and I am sure that this could be the cookie jar that can be in your family for generations. Now you can spice up your food with this fun Olaf Salt And Pepper Shaker Set. 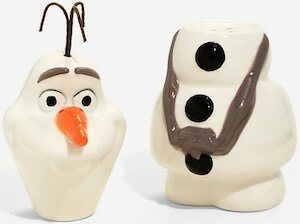 If you like Frozen or a snowman then you should check out this fun salt & pepper shaker. The shaker set is made from ceramic and has two pieces that each can hold their own spice and when you stack them it becomes Olaf the friendly snowman from from Frozen. Having this cute snowman on your dining table is fun anytime of the year and it will fit perfect for the holiday season to as snow is perfect for Christmas and that makes Olaf festive too. This Christmas you can have a giant in your yard all thanks to this 8 feet Christmas Olaf inflatable. This outdoor inflatable is Olaf from the Frozen movie and he is ready for Christmas as he is holding a candy cane and is wearing a Santa hat. 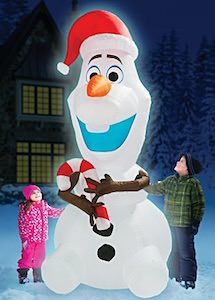 And this is not just a normal inflatable as the Olaf inflatable is 8 feet tall and that is the perfect size for kids to be excited about as it is so much bigger then them. The inflatable Olaf snowman comes with the pump to keep it inflated and has 5 c7 lights build in so that it looks amazing at night too. If you are looking for a fun winter hat for a little fan of Frozen then you should check out this Anna winter hat. The hat is made from 100% acrylic and will make your little one really happy if they like Anna. The hat has a furry edge and it has braids just like the hair of Anna and that makes this fun for wearing outside when it is cold but it can also part of your child playing Anna as it looks almost like the real hat Anna would wear. 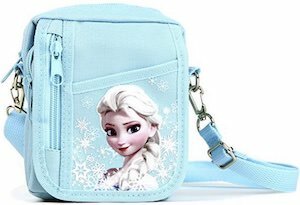 Now is the perfect time to get your child ready for winter in style of Frozen. If you want to know the time and like winter then you should check out this Olaf and phone boot wall clock. 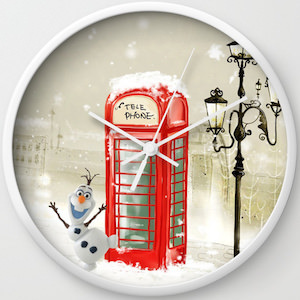 The clock face shows a nice classy scene that shows an old red phone boot and light post and there is snow on the ground and then there is Olaf from the Frozen movies just standing around looking really happy. The Frozen wall clock has a 10-inch diameter and comes in a white, black, and wood housing and the arms of the clock come in white and black so that gives you lots of options for an amazing looking timepiece. 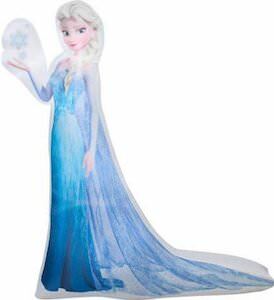 Elsa the snow Queen from Frozen needs to be in your yard this Christmas season and that is why they made this 5 feet tall Elsa outdoor inflatable. 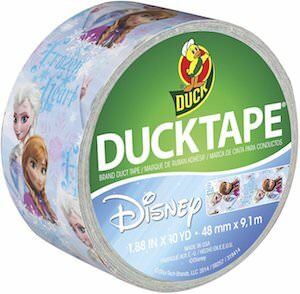 Elsa looks just like you would expect her to look in her long blue dress and white hair having a snowflake floating above her hand. 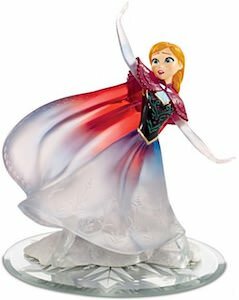 The self-inflatable Elsa can be seen in the daylight or at night because Elsa has LED lights so that you can see her in the dark too. 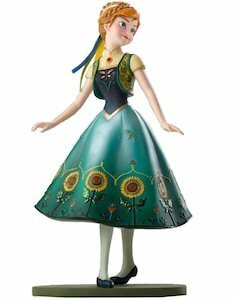 So add a queen to your outdoor Christmas decorations this season because Elsa from Frozen would love to be part of your garden.